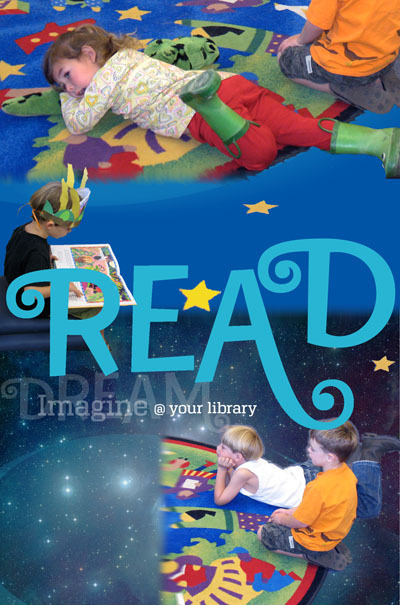 …and to celebrate, I made a new READ poster, with my colleague Gail modeling her new Halloween hat! She is reading the delightful book, Halloween Hats, by Elizabeth Winthop and illustrated by Sue Truesdell. I’m looking forward to combining my own hat collection with the library’s dress-up trunk hats for a hat-licious Halloween storytime on Saturday. Page the Bookworm will be back from his travels this week for Page Presents on Friday, with the scary story, “Wait ’til Martin Comes.” There will be cats, and more scary cats! It was a treat to tell in their beautiful children’s performance space, with its towering trees inspired by Ernest Shepard’s illustrations of the Hundred Acre Wood and Owl flying overhead. The acoustics were incredible. It was like a cone of silence with no sounds from the store intruding. There was enough reverb to make our flute and harp music sound rich and full, yet we could hear each other with crystal clarity. I hope we’ll have other opportunities to play music and tell stories there! I’ll post some pictures when I get a chance. This month is way too full of good things! This week I told a Scottish version of Aaron Shepard’s wonderful version of The King o’ the Cats, with a cast of thousands (well, it seemed like thousands!) of kitties and the fantastic help of my colleague and second puppeteer, Amy. Amy and I both brought a childhood cat hand puppet to join the cast, and Amy also brought her collection of beanbag kitties. Our colleague, Gail, brought her collection of beanbag kitties too! Matt got everyone in the mood by teaching them steps to dance to the jig, The Loch Ness Monster, by the Whistlebinkies. That was definitely a workout…I had a hard time catching my breath to begin my story! Young Andrew Black has a reputation for telling whoppers. One night he can’t sleep and gets up in the middle of the night to make a cup of tea. To his astonishment, the kirk is blazing with light. Since he is sexton, he takes his keys and quietly lets himself in. He can hear muffled meows, and the sounds lead him to the nave, which is full of cats sitting upright in the pews like people! There is a richly dressed cat kneeling at the altar, where a bishop cat is solemnly meowing over him. Then an altar kitten brings a red velvet cushion with a golden crown. When the bishop cat sets the crown on the head of the kneeling cat, the congregation breaks into a chorus of joyous meows! Young Andrew runs straight home, jumps into bed, and pulls the covers over his head! Early the next morning, he tells Father Allen what he has witnessed, but Father Allen warns him not to tell any more whoppers. Only Father Allen’s big white cat, Tom, seems to take an interest. Later in the day, returning from an errand and taking a shortcut across the fields, Andrew sees the king of the cats and his court riding saddled foxes in pursuit of a Gordon Setter, which they are hunting with bows and arrows. The king’s fox stumbles, and the king falls off and hits his head on a rock. Andrew sees the other cats place the king’s limp body on his fox and then they all ride away. Father Allen takes even less interest in this story, but Andrew sees Father Allen’s big cat, Tom, staring at him with interest. Father Allen tells Andrew that there is a grave to be dug, and Andrew gets to work in the graveyard. It is near midnight when Andrew finished digging the grave, and suddenly he hears a rhythmical meowing. Soon a funeral procession approaches, with the pallbearers crying Meow! every third step. As the cortège draws even with Andrew, the bishop cat raises his paw and calls a halt. Then he turns and speaks directly to Andrew. “Tell Tom Tildrum that Tim Toldrum is dead!” he says. Then he lowers his paw and the cortège passes. Andrew doesn’t wait for more, but runs straight to Father Allen. As he pours forth this unlikely story, he notices that Father Allen’s cat, Tom, is stretching himself taller and taller. Then Tom speaks! “Tim Toldrum dead? Then I’m the King o’ the Cats!” And he leaps out the window, never to be seen again. After the story, everyone had fun making a King o’ the Cats mask. And there were even some Princess Cats! I always wanted to be a storyteller. But no one ever seemed to hang on my words as I went through life, so I decided that this was one dream that I should probably let go of. Still, my interest in stories and storytelling never waned. One day in Austin, Texas, I witnessed the storyteller’s spell being woven on a city bus. Although they weren’t making any noise, I became aware that there was a large cluster of kids in the back of the bus. As I glanced nervously around at them, anticipating trouble, I was struck by their charged silence. In the next moment, I realized that 1) the kids were deaf; and 2) one of them was telling a story. And, in the next moment after that, I realized that the storyteller held her audience completely in thrall. I started hanging out with storytellers, and, before I knew it, they were getting me to tell stories. In his fable, Crow and Weasel, Barry Lopez has a wise old Badger give two young adventurers some advice about the power of stories. At some point I realized that it’s not about the storyteller, it’s about the stories. Why do the same story bones appear in many different cultures around the world? Stories would not survive and be passed down to us (and they would certainly not spread across the globe) if they did not convey information that is crucial to our survival as a species. And, since each person brings a unique perspective to the story, each person will take away something different. A good story has something for everyone. About a year ago, I found myself in storytelling boot camp. With a weekly storytime class to produce, I don’t have time to lovingly craft my stories. I’m lucky if I have time to read over a story more than once, and now that’s all I need to remember the bare bones of the story. The rest I have to fill in on the fly. What better training could there be? In my efforts to give stories away where they are needed, I seem to have lost all fear of making a fool of myself. It was a Halloween extravaganza at Page Presents this week, featuring an elaborate puppet show requiring two puppeteers. I had the inspired assistance of my husband, Stuart, who designed the complex marionette for the disembodied pumpkin head and clothing items, and also of my colleague, Amy, who operated the marionette with flair after a minuscule amount of practice. And there was also the brilliant weekly musical contribution of Matt, who taught the kids ballet steps (jeté, chassé, de coté, and one more that I’ve forgotten) to perform with “Fossiles,” from Saint-Saëns’ Le carnaval des animaux. Our featured story was The Little Old Lady Who Was Not Afraid of Anything, by Linda Williams and illustrated by Megan Lloyd. Two shoes go CLOMP, CLOMP. And one gigantic orange scary pumpkin head go BOO, BOO. The kids loved chiming in to recite the list of all the things chasing after the little old woman. Naturally, after the little old woman slams and locks her door and sits down by the fire in her rocking chair, there comes a KNOCK, KNOCK at the door! Should she answer it? Well, as you know, she is the little old lady who is not afraid of anything. So she opens the door a crack, and what do you think she sees? Yes, you guessed it. “What are you doing here?” she asks them. “We’ve come to SCARE you!” says the scary pumpkin head. “But I’m not afraid of anything,” she declares firmly, and the scary pumpkin head looks crestfallen and the pieces of clothing droop dejectedly. “What are we to do, then?” the scary pumpkin head wonders. “I have an idea,” she exclaims and whispers in the pumpkin head’s ear. The clothes all perk up. “Good night,” she calls to them. “See you in the morning!” And she shuts the door and goes to bed. The next morning, she wakes up and looks out her window, where she can see…a CLOMPING, WIGGLING, SHAKING, CLAPPING, NODDING, BOOING Scarecrow frightening away all the crows! Amy had to magically disassemble the marionette and then reassemble it (in the proper order) on a pole, while I folded back the forest scenery to reveal the cornfield with crows, which I then flipped into the air with a final flourish. But we really pulled it off, to everyone’s delight. This week the New York Times reported that picture books are “no longer a staple for children,” asserting that the decline is only partially due to the shrinking economy. The article seems typical of the corporate mindset and uncritical fear-mongering that passes for news reporting these days. The reporter interviewed book store owners and spokespersons from publishing companies and quoted from posts on a book blog and a parenting website—but somehow didn’t think of interviewing any librarians. Even if the NYT had asserted only that picture books are no longer a staple for publishers and booksellers, this begs the question of what is happening in the publishing industry in general. Noticed any bookstores closing lately? any publishing companies declaring bankruptcy? I thought so. Somehow I don’t think it’s just because of a decline in picture book sales. The economic downturn is certainly a major factor, but many in the industry see an additional reason for the slump. Parents have begun pressing their kindergartners and first graders to leave the picture book behind and move on to more text-heavy chapter books. Publishers cite pressures from parents who are mindful of increasingly rigorous standardized testing in schools. This would certainly be alarming if true, but, judging from the numbers of picture books we check in and out at our branch every day, and the negotiations I witness between children and their parents over how many and what kinds of books they can borrow, I’m not worried about the demise of picture books. Children develop at wildly different rates, and their tastes—in reading as in everything else—are utterly individual. Most of the parents and grandparents that I encounter are happy to let their kids choose books they like, while always providing opportunities to broaden their horizons. The parents who worry me the most (who are also usually the ones pushing their children to consume ever more challenging literary works) are people who clearly do not themselves enjoy reading. Actions speak louder than words, and their children have absorbed only too well their parent’s feeling that reading is hard work. In a state ranked 49th in the nation in fourth grade reading proficiency, I am worried about reading education and about education in general. But that is another story. Many commenters to the NYT story point out that they cannot afford to buy new picture books, but instead check them out at the library and/or purchase used books. A librarian went to the trouble of crunching the numbers to assess picture book circulation at her library, and discovered that there was actually a 10 percent increase this year, and a 15 percent increase the preceding year. a January 2010 Harris Interactive Poll (PDF)…provides compelling evidence that a decade-long trend of increasing library use is continuing — and even accelerating during these economic hard times. This national survey indicates that some 219 million Americans feel the public library improves the quality of life in their community. More than 223 million Americans feel that because it provides free access to materials and resources, the public library plays an important role in giving everyone a chance to succeed. For my own part, I am bringing all of the arts plus a soupçon of legerdemain into getting kids excited about reading. I want them to discover the joy of learning at their own pace and on their own terms. I want them to see the library as a magical place full of undiscovered pleasures, as I do. Nec me fugit quam assiduus sis in bibliotheca, quae tibi Paradisi loco est. I know how busy you are in your library, which is your Paradise. Grow and grow and grow! As the tree grows taller and taller, her song changes to “Branch and branch and branch,” “Flower and flower and flower,” and “Ripen and ripen and ripen.” When the plump oranges appear, she is so excited that she dances around the tree singing “Grow and grow and grow,” and the tree responds by growing up into the clouds! But the resourceful child just changes her song to “Lower and lower and lower,” and the tree obligingly returns to a normal size. When her stepmother sees the oranges, she grabs the girl and insists that she show her the tree. Then she leaps into the tree and begins picking all the oranges, but the girl sings “Grow and grow and grow,” sending the tree and her stepmother up into the clouds. Then she cries, “Break, orange tree! And the tree (and the stepmother) break into little pieces. The little girl searches among the pieces until she finds an orange pip, and soon a new magic orange tree begins to grow and grow and grow. They practiced clapping the rhythm, and then they learned how to add shakers to the basic rhythm. Then we taught them the “grow and grow and grow” part of the song, and they all chimed in during the story. After the story, everyone made a magical orange tree. I overheard one little girl lamenting to her mother that her tree did not have a handle. Her mother told her it was because their paper bag came without a handle. I told her, “I can make a handle for you,” and I got a hole punch and some ribbon and voila! her tree had a handle! She was so happy with the handle on her tree that she kept walking around holding it up and peeking out through the handle, which made me realize that the trees were actually bodi-puppets. Silly me, for not seeing her as she really was: a Magic Orange Tree! At our monthly Origami Cool Zone workshop, we made waterbomb jack-o’-lanterns and three different bat models. Dawn suggested the waterbomb pumpkins, which look most pumpkin-like when faces and stems are added! She also suggested the tumbling bat model, which flips end-over-end when it flies. Brian suggested Nick Robinson’s bat model, and discovered that, when made with 4-inch paper, it looks great wrapped around a tootsie roll! I contributed one of Stephen Weiss’s flying bat models from his book, Wings and Things: Origami That Flies. This bat has a long, soaring glide path, and it works best if flown from a high place. Some of the kids figured this out immediately, and stacked a lot of nesting stools and climbed on top to launch their bats. I tried to capture some photos of the flying bats! It’s turning into a Diane Wolkstein festival! This week’s Page Presents class featured another of her stories from Haiti, Bouki Dances the Kokioko, illustrated by Jesse Sweetwater. The King of Haiti loves dancing, and nothing would make him happier than to have dancers performing for him every night. Ah la la, ah la la la la. Soon he finds himself dancing along with his new tune—he has invented a new dance! And this leads him to hatch a plan. He will sponsor a dance contest, with a handsome reward for the person who can guess the king’s new dance! Soon there is a never-ending line of dancers eager to dance for him, and the king is royally entertained every night. Weeks and months go by, and, while some dancers guess some of his dance moves, no one has put all the moves together perfectly. One night, his gardener, Malice, is on his way home when he realizes that he has left his sunhat in the garden. He goes back to get it, and hears someone singing the king’s dance tune. Coming closer, he sees that it is the king himself, rehearsing his dance so he doesn’t forget it. Matt taught the kids two dance rhythms for the king’s song: a Haitian rhythm and a Brazilian samba rhythm. He handed out the shakers, and everyone kept the beat with the shakers while I sang the song and Matt played the two rhythms on a wood block. Then I taught everyone how to dance the king’s dance. When I reached the point in the story when the dancers come to compete for the prize money, several of the kids came up and danced to the song. They did a great job of portraying the top dancers of the competition who kept the king entertained night after night. 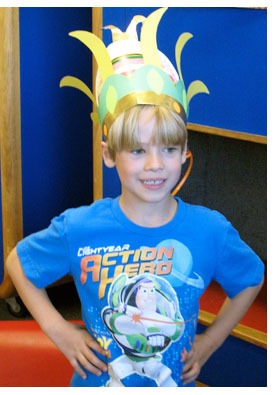 Afterwards, we made fabulously funky crowns like the one the king wore in the book. Miles and Ravi, who have preschool and arrive just in time for the craft, again wanted me to tell them the story. And after I told them the story, Miles wanted me to read it to him. I got called away for a moment, and when I returned, I found him studying the book on his own.